New with Clipboard: Creates the new draft with the current contents of the system clipboard. New with Selection Create a new drafts using the current text selection from another draft. Great for splitting off some text from a longer draft. Dictate: Opens Drafts custom dictation interface, ready to accept dictation. Import File: Opens the system Files.app file browser to import text files from any Files app source (iCloud, Dropbox or other services with document provider integration). New in Workspace: If you have any workspaces based on tag-filters, they will be listed here. 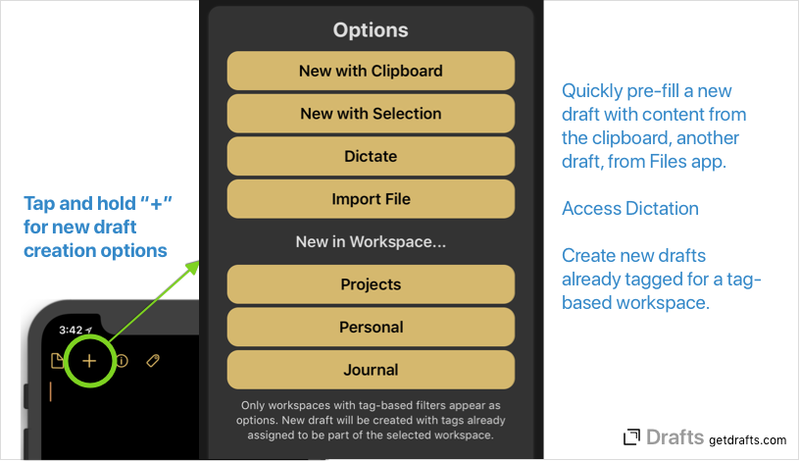 Selecting one will create a new draft with tags already assigned to place the draft in that workspace.